There are a couple of very basic purification methods that are used routinely in the laboratory, and that are actually key steps in other methods. Evaporation is one of them. Evaporation starts with a solution. In a solution, one compound is dissolved in another. For example, sugar water and saltwater are solutions. The sugar molecules can dissolve in the water because of hydrogen bonding; these strong intermolecular attractions allow the water molecules to pull sugar molecules apart from one another. The sugar molecules interact with the water molecules instead of with each other. Figure PM1.1. A cartoon representing the dissolution of sugar in water. In saltwater, ion-dipole interactions pull the sodium ions apart from the chloride ions in the salt. Instead of interacting directly with each other, the ions interact with the partial charges on the polar water molecules. Figure PM1.2. 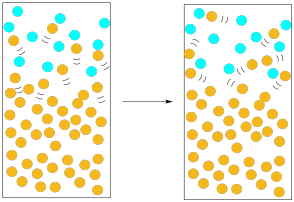 A cartoon representing the dissolution of salt in water. In a solution, there is always a liquid compound that dissolves the other compound. This liquid compound is called the "solvent". Water is a very common solvent, but there are other ones, too. The compound that gets dissolved is called the "solute". This compound could be a solid, a liquid, or even a gas. Life in the oceans depends on gas-phase oxygen from the atmosphere dissolving in the water so that respiration is possible in marine organisms. Life on earth depends on solid minerals dissolving in water so that they can be taken up by plants and other organisms. In evaporation, we are undoing the dissolving process. We are removing the solvent so that the solute is left by itself. That would be pretty hard to do if the solute were a gas, but it can be relatively easy if the solute is a liquid or solid. The most straightforward case would be if the solvent had a very low boiling point. To isolate the solute, it would be a simple matter of waiting while the solvent molecules all move from the liquid phase to the gas phase. The change from liquid phase to gas phase is called evaporation. Once the solvent had gone into the gas phase and escaped, we would be left with only the solute. Figure PM1.3. 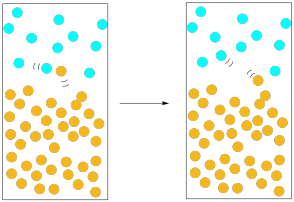 A cartoon representing evaporation, leaving the solute behind. Today, sea salt is sometimes used by cooks because they feel it tastes better than regular salt. Regular table salt comes from salt mines; miners remove it from mineral deposits in the ground. Sea salt, of course, comes directly from the sea. To get the salt out of the seawater requires evaporation. The trouble is, water does not have a very low boiling point. It does not evaporate all that quickly. To get around this problem, seawater is usually heated in pans until the water evaporates, leaving the salt behind. The added heat helps to give the water molecules enough energy to get into the gas phase. The heat may come from peat or wood fires, or even from sunlight. Figure PM1.4. The addition of heat can speed up evaporation. Adding heat is a perfectly good way to produce sea salt from seawater. In the laboratory, however, we don't always want to heat things that we wish to evaporate. There are a couple of reasons for that. First, the solute that we wish to isolate may be sensitive to heat. It may decompose if we heat it up. Second, the solvent that we wish to remove may be flammable. It may catch fire if we heat it up. In short, we may prefer not to use heat because we don't want to burn things. How do we solve this problem? A physical chemist would tell you to think about pressure. Pressure is an ever-present factor in chemistry, but we don't often think about it because we are used to spending our lives under a fairly constant atmospheric pressure. To understand how pressure plays a role in evaporation, we need to get a more complete picture of evaporation. In our previous pictures of evaporation, we ignored the atmosphere above the solution. The air is important here. All of those nitrogen and oxygen molecules whizzing around in the air exert a pressure on us, and on the solution. If a solvent molecule begins to move out of the liquid phase and into the gas phase, what is likely to happen? It will probably collide with one of those oxygen or nitrogen molecules in the atmosphere above the solution. When it collides, chances are that it could get knocked down into the liquid phase again. Figure PM1.5. Atmospheric pressure can slow down evaporation. The solvent would have a greater chance of escaping if there were many molecules moving into the gas phase at once. Statistically, if there are many molecules emerging from the liquid, the chances are pretty good that a substantial number of them will escape without being knocked down. Furthermore, the more molecules we have escaping the liquid, the more likely that we reverse the picture: instead of nitrogen molecules knocking solvent molecules back into the liquid, solvent molecules are knocking nitrogen molecules out of the way, clearing a path for others to follow. Figure PM1.6. A higher presence of the solvent molecules in the gas phase (vapour pressure) increases evaporation. This idea leads us to the concept of vapour pressure. Vapour pressure is the pressure exerted by the solvent molecules in the gas phase above the liquid. The higher the vapour pressure, the more easily the liquid evaporates. When the vapour pressure of the liquid exceeds the atmospheric pressure, the liquid comes to a boil and rapidly evaporates. The way to increase the vapour pressure is to heat up the liquid. The energy imparted to the solvent molecules will put more of them into the gas phase, and those molecules in the gas phase will exert more pressure above the liquid. Boiling point is a function of vapour pressure. Vapour pressure is a function of temperature. Now, we can use the concept of vapour pressure in an opposite way. We can heat the liquid up until it reaches its boiling point -- that is, until its vapour pressure is greater than the atmospheric pressure. Alternatively, we could lower the atmospheric pressure until it is lower than the vapour pressure of the liquid. Once the vapour pressure of the liquid exceeds that of the atmosphere, the liquid will boil. Boiling point is a function of pressure. To accomplish that task, all we need is a vacuum pump. The vacuum pump sweeps the gas phase molecules away, lowering the atmospheric pressure. At some point, there are so few nitrogen and oxygen molecules that their vapour pressure becomes lower than that of the solvent. The solvent boils, even though its tempreature has not been raised. Figure PM1.7. Reducing the local atmospheric pressure can speed up evaporation. This approach is usually taken in the laboratory using a rotary evaporator. A rotary evaporator uses some method of lowering the atmospheric pressure above the solution that is meant to be evaporated. It may require a vacuum pump or an aspirator. Working with reduced pressure can be difficult. The most common problem is that, when the atmospheric pressure is reduced, the solution rapidly over-boils, making a mess everywhere. Use of a rotary evaporator requires that the user is aware of a few steps to avoid problems. First, the solution is placed in a dry, round-bottom flask, and it is important that the flask is always less than half full of the solution. One quarter full is fine; one third full is OK. Half full may lead to problems. The fuller the flask, the more likely that, if the solution comes to a full boil, it will need to expand all the way out of the flask (it will overboil). Second, a rotary evaporator has a motor that spins the flask on its axis. It is usually a good idea to spin the flask very rapidly. The resulting centripetal force can help to keep the solution in the flask where it belongs, rather than overboiling. Also, that centripetal force will keep the solution spread out over the walls of the flask. That will maximize the surface area of the liquid, maximizing the rate of evaporation. Third, rotary evaporators have a water bath that allows the solution to be warmed. This capability offsets the fact that evaporation is an energy-consuming process. If the solvent starts to evaporate, the evaporating molecules will draw heat in from their surroundings. The flask and the solution will start to get colder. The vapour pressure will drop. The solvent will stop evaporating. To cut that process off, we place the flask in a water bath. Water has a high heat capacity, so it can store lots of heat without much temperature change. It can also release some heat to the flask without getting much colder. It stabilizes the temperature, so that the vapour pressure of the solvent does not drop, and evaporation can continue. In many cases, a room-temperature water bath is all that is required for steady evaporation. If needed, the water can be heated up, but heat and vacuum should always be combined very cautiously. You don't want to overdo it and have the solution overboil. Indicate the order in which the following liquids would evaporate, from most quickly to most slowly.